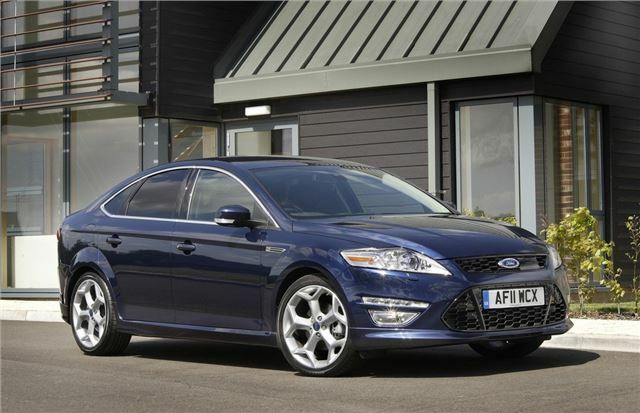 The refreshed 2011 model year Ford Mondeo range now offers powertrain enhancements. Spanning 1.6, 2.0 and 2.2-litre displacements, the latest engines feature emissions which are lower by up to 20 per cent than earlier models. "The introduction of our new small displacement diesel engine to Mondeo, and Ford's Auto-Start-Stop system, are important steps towards meeting customers' demand for performance, comfort and refinement coupled with outstanding fuel economy," said Kevin Griffin, Ford of Britain fleet director. "The Ford Mondeo's powertrain line-up reflects the 1.6 engines' all-round capability, while its 2.0 range offers unprecedented performance." And we can confirm what he says after test drives in both the 1.6 EcoBoost 160 petrol and 1.6 TDCI 115. The 1.6 EcoBoost is geared at 30mph per 1,000rpm and the 1.6 TDCI at 35mph per 1,000rpm, but with the 6 speed transmission neither gearing is too ambitious. Both cars are astonishingly smooth and refined; the diesel slighly more so on the motorway because of its longer gearing. Handling, roadholding and ride comfort remain best in class, compromised only slightly by ruts, grooves and broken surfaces on the UK's often apalling roads. However, this ie easily alleviated by not specifying a model with 18-inch wheels and 40 profile tyre. The 1.6 160 Ecoboost offers 149g/km in the EC tests and 44mpg; the 1.6TDCI115 114g/km CO2 andf 65.5mpg in the EC tests. BIK tax per month is £116 for the 1.6 160 (down from £155pm for the 2.0 petrol) and £89pm for the 1.6TDCI 115 (down from £130pm for the 2.0TDCI 115). Out on the road you simply cannot tell you are driving a 1.6 rather than a 2.0 litre. These engines are also now available in the S-Max and Galaxy. Both the Ford Mondeo's 1.6 115PS TDCi diesel and EcoBoost 160PS petrol units boast Auto-Start-Stop as standard. The diesel's CO2 emissions of 114g/km, equating to 65.5mpg for both five-door and estate bodystyles, make it the most frugal Mondeo ever. Emissions have been reduced by 12 per cent, or 25g/km, compared with the 2.0-litre 140PS diesel engine. Other Ford ECOnetic Technologies contributing to this achievement are an aero kit including lowered suspension, smart regenerative charging, Active Grille Shutter and Eco Mode driver feedback. The new 1.6-litre TDCi delivers 270Nm of torque (290Nm with overboost) from 1,750-2,500rpm. Ford's new EcoBoost petrol engines combine three technologies, which enable a smaller displacement to offer fuel economy benefits and more power than conventional larger capacity versions. Direct injection, turbo charging and variable cam timing mean the Mondeo's 1.6 EcoBoost delivers up to 160PS, 44.1mpg and 149g CO2/km – 20 per cent better than the 2.0-litre 145PS petrol. Ford Auto-Start-Stop system can reduce fuel consumption and CO2 emissions by up to five per cent in mixed driving conditions. In an urban environment and in heavy traffic with frequent stops, the savings could increase to as much as 10 per cent. Ford Auto-Start-Stop features an enhanced, durable starter motor to support the increased number of engine starts and a high performance Improved Flooded (IF) Battery with a Voltage Quality Module (VQM). This maintains the energy supply to electrical components such as the entertainment system during engine restart. In addition a Battery Monitoring System (BMS) continuously checks the battery charge and communicates with the Auto-Start-Stop function, so the system leaves the engine running in the event that the battery does not have sufficient charge. The Auto-Start-Stop system's sensors detect when the driver performs an action that signals the intent to drive off, such as pressing the accelerator or clutch pedal. As soon as the driver prepares to move away, the engine starts almost instantly – it only takes around 0.3sec to fire up. The process is virtually imperceptible, and happens before gear selection is completed. Following the 2.0-litre EcoBoost 203 and 240PS range-topping petrol choices announced at the launch of the new Ford Mondeo, a premium 2.2 TDCi 200PS diesel has been added to the Titanium series. This performance engine provides 420Nm of torque (450Nm with overboost) while retaining fuel economy at an impressive 47.1mpg. The diesel flagship is available with Ford's smooth-operating six-speed automatic transmission for a powerful yet relaxed driving experience. The renewed auto box is a second generation of the well-proven Durashift 6-tronic transmission. This torque converter transmission is a perfect match for the torquey 2.2-litre unit. *In 4th gear. Ford test figures. The declared fuel consumptions and CO2 emissions are measured according to the technical requirements and specifications of European Directive 80/1268/EEC or the European Regulation (EC) 715/2007 amended by (EC) 692/2008. Fuel consumption and CO2 emissions are specified for a vehicle type and not for a single car. The applied standard test procedure enables to compare between different vehicle types and different manufacturers. This information is not part of any product offer made. Real world fuel consumption can vary as the fuel efficiency of a vehicle is influenced by (individual) car configurations, driving behaviour, use of technical equipment such as air conditioning, as well as other non-technical factors. DPF = Diesel Particulate Filter. All petrol engines are equipped with a catalytic converter.